Villa Arabella: A three bedroom villa with sea views in the Puerto del Carmen resort in Lanzarote. It is fully equipped including satellite TV, a dishwasher and a washing machine. Villa Arabella is our new villa with sea view in Lanzarote. It is situated in the Puerto del Carmen area and is only a 10 minute walk from the harbour and Old Town where guests can find a good selection of fish restaurants and bars to choose from. There is a private solar heated pool and a sun terrace with sun loungers. For alfresco dining there is a pergola covered terrace with patio table and chairs and a barbeque. This sea view villa is well equipped inside with satellite TV, a dishwasher and a washing machine. The best thing about this villa though are the prices, which are very reasonable. 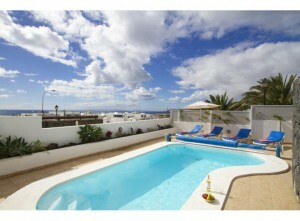 Book this villa with sea view Lanzarote now! 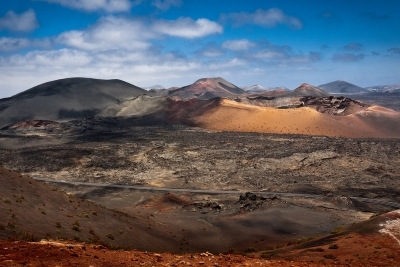 The Rancho Texas Lanzarote Park is situated just on the outskirts of Puerto del Carmen. It is well worth a visit by the whole family. The children in particular will love it. 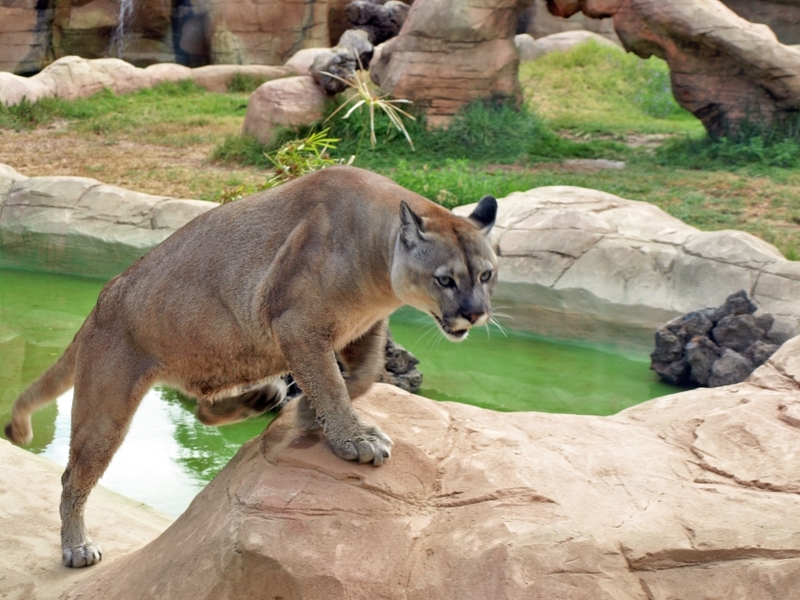 You can mine for gold at an Indian village, swim and interact with the sea lions, feed the falcons, vultures and eagles, go on pony rides, or take trip on a canoe, play water games in the pool, or just simply watch hundreds of birds, reptiles and mammals in their natural habitats. The animals at the park include pumas, white tigers and Nile crocodiles. This theme park is open daily between 9.30am and 5.30pm and there is also a restaurant on site. There is also entertainment in the evening. Don’t miss out on the Country and Western night. On arrival you will be ushered in to the saloon bar by the cowboys. Everyone is in suitable costumes. There are even Indians and saloon girls. Entertainment is provided and a buffet barbeque. Villa Lola: a modern three bedroom three bathroom detached villa with private heated pool. Villa Lola is a modern villa to rent in Puerto del Carmen with three bedrooms and three bathrooms which can sleep up to 6 people. 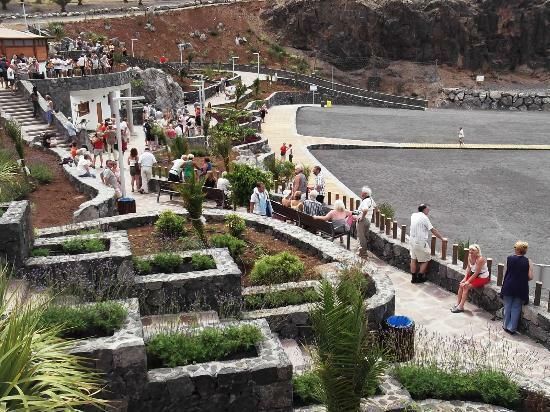 It is located in the Old Town area of Puerto del Carmen and is very close to the cliffside walk, which overlooks the ocean towards the Puerto Calero marina. The villa is very well equipped and includes all the mod cons which you would expect to find in a high quality holiday villa, including a dishwasher, washing machine and satellite TV. There is also an alarm and a security safe. Tourist attraction in the Haria area on the Northern tip of the island. 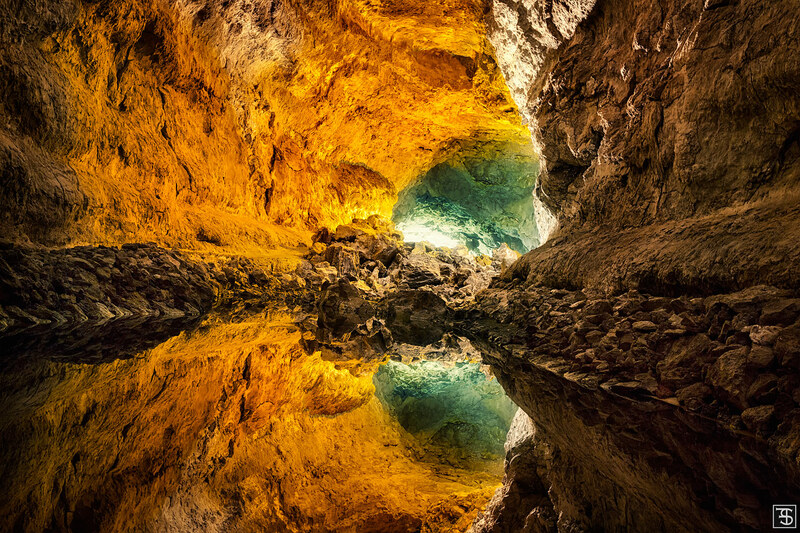 Cueva de los Verdes is a tourist attraction located in the Haria area, in the North of the island, which was opened in 1964. The caves were formed around 3000 years ago after the eruption of the Corona Volcano, and when the lava flowed underground from the cone of the volcano down to the sea. Today you can visit the caves and take guided tours. The tunnel is around 6km long, but the tour covers just 1km. The colours are amazing and an effective lighting system has been installed in the caves to show these off to their best, with subtle music. In the past the inhabitants of the island used these caves to hide from Muslim slave traders and pirates. Victoria Court I 94 – One Bed: A 1st floor apartment with pool view in the Los Cristianos resort in Tenerife. One of our apartments to rent on Victoria Court I, this apartment is on the first floor and enjoys good pool views, as can be seen in the photo on the left (click on the photo to read more about the apartment and to see photos). 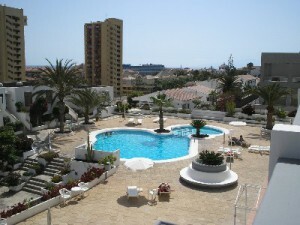 The complex is situated close to the sea front in Los Cristianos, Tenerife. The apartment has satellite TV with English channels, and also a walk-in shower in the bathroom. The apartment is due for a full refurbishment later this month, so look out for the new photos, which will be coming soon. 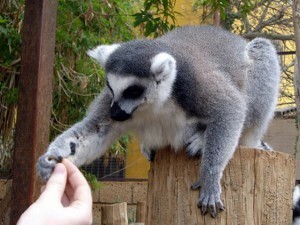 Feed the monkeys at the Monkey Park in Tenerife. If you have had enough of sun-bathing or lazying by the pool or on your balcony, why not hire a car and visit the nearby Monkey Park. 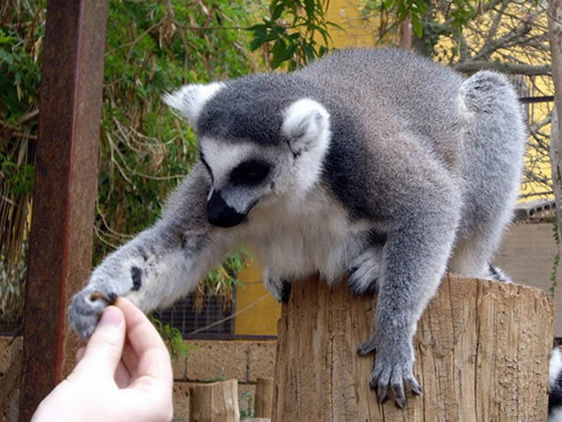 If you go early, you can help out with feeding the monkeys, which is a lot of fun. Some of the monkey are too dangerous and are behind bars, but some of the tamer ones are allowed free and they will even sit on your shoulder. Great photo opportunity! 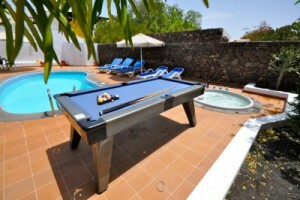 Villa Whitney is a three bedroom three bathroom villa in the Los Mojones area of Puerto del Carmen. This villa with air conditioning in Lanzarote was fully refurbished in 2010. There are three bedroom and three ensuite bathrooms. The living room has satellite TV and the modern fully equipped kitchen includes a dishwasher and washing machine in a separate utility area. Outside there is a private heated pool, jacuzzi and pool table. The villa and grounds are surrounded by high walls offering guests complete privacy. Situated in the South Western area of the island and known as the Fire Mountain. This national park is situated in the South Western part of the island and is known locally as the “fire mountain”. This is because 100 years ago there was a very large volcanic eruption which lasted for 6 years and destroyed several villages. There are a total of 36 volcanos in the park and the area resembles the surface of the moon and there are very rare plant species. There were even moon landings practiced here. There are tours of the National Park, which can be booked. Guests should park their cars near the El Diablo restaurant, and are then taken in a tour bus all over the National Park. The tour starts with a demonstration of how hot the earth is underneath. Water is poured down a hole in the lava and moments later water erupts out of the rock. You can feel the hot ash and straw is set alight by the heat. Camel rides can also be booked. Villa Donna: A three bedroom townhouse with air conditioning on a complex in the Almijara urbanisation in Nerja, Costa del Sol. This villa with shared pool in Nerja is situated on a complex in the Almijara urbanisation. It is a townhouse which can sleep up to 5 people in three bedrooms: two double rooms and one twin. The property also has satellite TV including English channels. The complex has 2 shared pool, as well as a sauna. The nearest supermarket is only a 5 minute walk. The best thing about this villa however, is the price. If you are looking for a villa, but you have a restricted budget, then this is an ideal villa for you and your family. 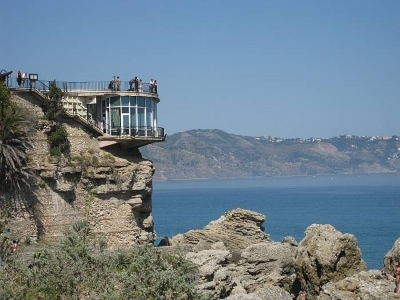 The most famous tourist attraction in Nerja, which has been created fromt he old Moorish fortress and has amazing panoramic views of the whole coastline. Nerja started as a fishing village and still retains a lot of its original charm including its narrow, winding streets and the white washed houses. It is 56km from Malaga airport and the population is 14,000 people but this triples in the Summer months. Nerja is popular as it enjoys mild temperatures all year round and 320 days of sunshine per year. Local industries include fishing and agriculture, but recently tourism has grown to be the biggest source of income for the town. The little shops sell local arts and crafts and local produce. In the addition to Balcon de Europa, the Nerja Caves are also a widely visited tourist attraction. Infact it is said that they are the 3rd most visited tourist attraction in the whole of Spain. They used to be home to cave dwellers 30,000 years ago and have some impressive stalagmites. There is plenty to do in Nerja: take a horse and carriage ride through the town to see the picturesque sites. It is also worth a day trip to see some of the surrounding small white-washed villages. There are several large beaches but it is also worth seeking out some of the smaller coves which are less busy. Water sports which are available including water skiing, scuba diving, canoeing and you can also take sea kayaking trips. This lovely studio is one of our apartments to rent near Playa de las Vistas. 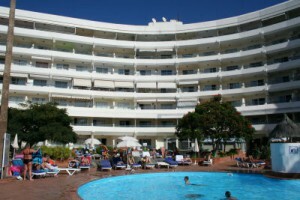 It is situated on the Azahara Playa complex in Tenerife with amazing sea and pool views. Azahara Playa – 44 – Studio: This studio is on the 4th floor of the Azahara Playa complex and therefore has panoramic sea views. This is one of our apartments to rent near Playa de las Vistas. It is situated on the 4th floor of the Azahara Playa complex, which is on the borders of Playa de las Americas and Los Cristianos. Due to its position on the complex the studio enjoys amazing panoramic sea views as well as overlooking the pool (as seen in the photo to the left). 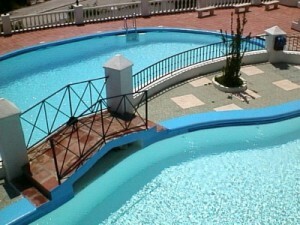 The complex is well maintained and now features a security fence around the pool for the safety of children. The studio can sleep up to 4 people with 2 single beds and a sofa bed. There is also a washing machine. This golden sandy beach is situated on the border of Los Cristianos and Playa de las Americas between Los Cristianos harbour and the Safari shopping centre. You can hire sun beds and parasols. 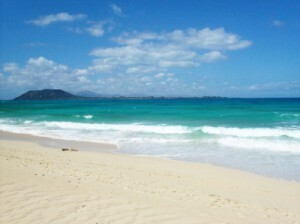 Las Vistas beach is 850 metres long consisting of artificially created golden sand. There are sun beds and parasols for hire, which are not too expensive (4 euros per day at the time of writing). There are break waters which keep the waves to a minimum and the beach slopes gently into the sea making it quite child-friendly. The beach is very clean and is maintained well. There is a lifeguard for safety as well as toilets. Water sports which are available on the beach include jet skis, parasail, banana boats and paddle boats. The promenade which stretches the length of the beach is lined with a good selection of bars, restaurants, cafes and shops. One of our Santa Maria apartments with sea view. This apartment has one bedroom and is on the 3rd floor with a double balcony off the lounge and bedroom. 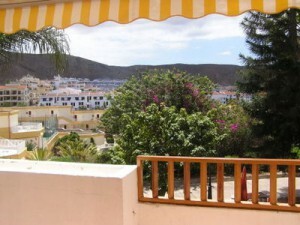 A one bedroom apartment on the 3rd floor of the Santa Maria complex with sea views. One of our Santa Maria apartments with sea view, it is located on the 3rd floor and has a large double balcony off both the lounge and bedroom. The complex is situated in the San Eugenio area of Tenerife. The lounge is furnished in a tasteful and homely style and includes a flat screen TV with satellite channels including English. The bedroom has two single beds. The bathroom has a bath with shower overhead, as well as a bidet, wash hand basin and WC. The balcony has a sun canopy with patio furniture including some comfortable seating. A highly recommended Indian restaurant in the San Eugenio area. Bombay Babu is a highly recommended Indian restaurant which is situated close to La Nina Hotel in the San Eugenio area of Tenerife. It has even been awarded a Certificate of Excellence on TripAdvisor. The talented chef offers authentic dishes including vegetarian and even a childrens’ menu. There are no artifician additives or colourings in the food. You can choose to eat inside or outside, or if you prefer your meal can be delivered. 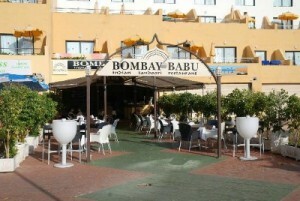 Bombay Babu delivers to a wide area up and down the coast from Santa Cruz down to Los Cristianos and up to Los Gigantes. Five bedroom villa in Callao Salvaje with amazing sea views. Villa Dionne is a large villa for rent in Callao Salvaje. 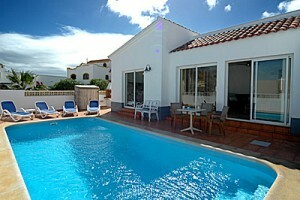 The villa has five bedrooms, four of which are in the main villa and there is also a separate apartment on pool level. The villa is furnished to a very high standard and has wifi internet access, as well as a dishwasher and washing machine. Outside there is an electrically heated private pool surrounded by sun loungers. The villa is wheelchair friendly as there is a ramp leading from the villa down to the pool. 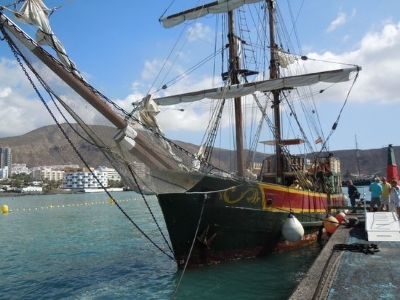 The resort of Callao Salvaje is situated between La Caleta and Los Gigantes and is around a 40 minute drive from the airport. There is a wide selection of reasonably priced restaurants to choose from as well as shops, a pharmacy, banks and supermarkets. In May 2012 the new beach, Playa Ajabo, was completed. It is a volcanic sand beach, complete with a life guard and beach showers. There are parasols, sun beds and little tables for hire where drinks and snacks can be served throughout the day.